Over the centuries the destinies of England and France were so closely intertwined that the languages of the two neighbours were bound to exert a profound influence over each other. The beginning of this special linguistic relationship goes back to the Norman Conquest of 1066. The Normans, themselves a Gallicised Germanic tribe, brought the French language and civilisation to the British Isles, ushering in a long period of cultural bilingualism. The historians of the English language see the year 1066 as a definitive watershed in its history, marking the transition from the Old English of Anglo-Saxons to the Middle English period. During this period English underwent drastic changes, which can be summed up as its “Gallicization”, or, to be more exact, “Romancization”, because the French influence combined with the impact of Latin, which was felt either directly or through the medium of French. The magnitude of those changes was such that in the Modern English period English evolves as a qualitatively different language that can be described as Germanic only with reservations. 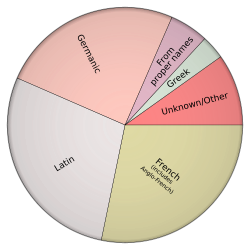 Indeed, some linguists put it in a class by itself – the one and only member of a “Romance-Germanic” group of languages. The “Romance” nature has been imparted to English by a vast lexical layer of words of French and Latin origin. Their number is well over half of the total lexicon of English. However, the long period of the coexistence of English and French affected not only the vocabulary but all levels of the linguistic structure of English, including the sound system, grammar, and orthography. Norman scribes re-spelt the language to accord with their own conventions. A French graphic convention is reflected, for example, in the French “ou” for ME “u” (e.g. “house”). Another orthographic change was to replace the Anglo-Saxon “cw” by “qu” – the combination of letters especially familiar to them from Latin pronouns. Thus, OE cwealm, cwēn, cwic were turned into qualm, queen and quik (modE quick). At a stroke English took on the outward appearance of a Romance language (cf. the loanwords quest, quit, quiet).